Welcome to Tamil Daily Calendar Website. 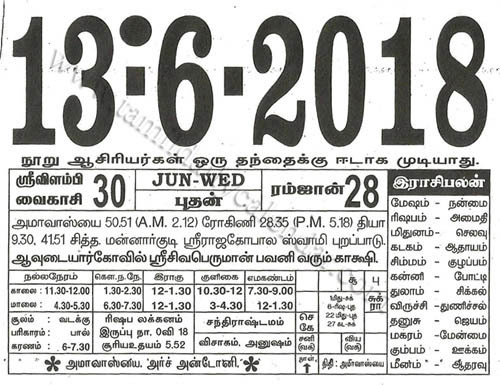 In service to tamil people all around the world, we bring you the tamil daily calendar sheets for your auspicious events reference. Calendars shown above is for Indian timings. Kindly consult your astrologers for the specific time for your auspicious events. Tamil Calendar is followed by Tamil people around the world is based on Moon and Star events. Tamil people traditionally follow the calendar to auspicous events and timings. Tamil Calendar is used in Tamil Nadu, Puducherry and Tamil people of Malaysia, Singapore and SriLanka. Tamil people refer this for all events like cultural or relgious. Traditionally Tamil year starts on 14th April every year. Week Days are named after the planets on solar system. Year is divided into six seasons each lasting for two months. Tamil calendar follows 60 year cycle closely resembling to other calendars followed in Indian subcontinent. Day starts with sunrise and ends with sunset. Fifth month Aavani and tenth month Thai are considered as very auspicious for the wedding and other events. Fourth month Aadi is considered as inauspicious. As per tamil calendar, tamil months starts with Chithirai and ends with Panguni. Chithirai - First month on tamil calendar. Chithirai first date is tamil new year. Usually falls on 14 April of english calendar. Chithirai month have 31 days. Chithirai thiruvizha celebrated in this month. Vaigasi - Second month on tamil calendar. Vaigasi month have 31 days. Favorable month of Muruga Kadavul. Vaigasi Visakam is the most important day of this month. Aani - Third month on tamil calendar. Aani month have 32 days. Aadi - Fourth month on tamil calendar. Aadi month have 31 days. Tamil people celebrate Aadi Amavasai and Aadiperukku. Aavani - Fifth month on tamil calendar. Aavani month have 31 days. Purattasi - Sixth month on tamil calendar. Purattasi month have 31 days. Ippasi - Seventh month on tamil calendar. Ippasi month have 29 or 30 days. Kaarthigai - Eighth month on tamil calendar. Kaarthigai month have 29 or 30 days. Maargazhi - Ninth month on tamil calendar. Maargazhi month have 29 days. Thai - Tenth month on tamil calendar. Thai month have 29 or 30 days. Harvesting month and Pongal celebrations are done on this month. Maasi - Eleventh month on tamil calendar. Maasi month have 29 or 30 days. Panguni - Twelth month on tamil calendar. Panguni have 30 days. This is the last month on tamil calendar. Donate To Support Us : This website is maintained for social cause and not for profit and not for any commercial interest.